Just then [Jesus'] disciples came back [from the village]. They were shocked to find him talking to a woman, but none of them had the nerve to ask, "What do you want with her?" or "Why are you talking to her?" The disciples return and find themselves confused and astonished. Jesus was doing the unthinkable — he is visiting with a woman from Samaria. 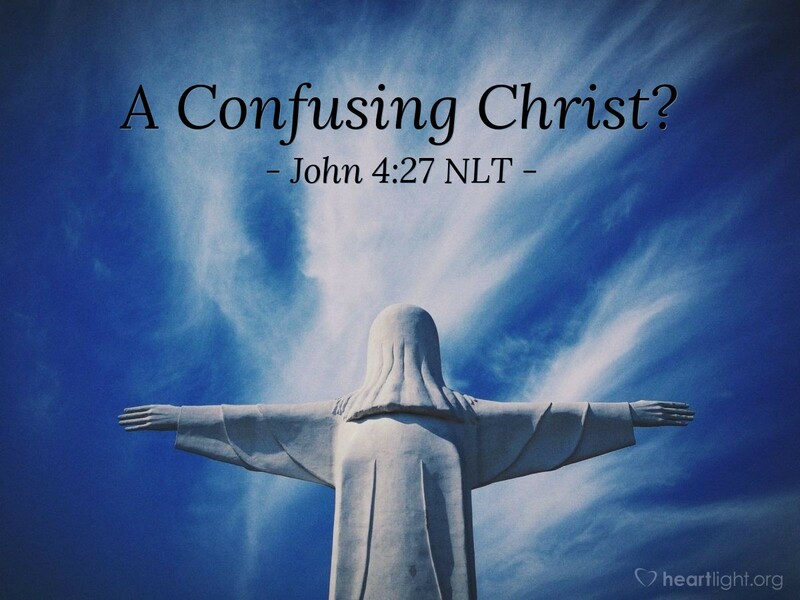 During their journey with Jesus through his years of ministry, they will find themselves confused again and again. Why? Because Jesus came to reach the lost, to save the sinner, to heal sick. He reached out and touched the untouchables and welcomed the outcast and sinners. He broke the religious culture's "rules of engagement" as he broke through every prejudice and every barrier to reach the seeking heart. We may not know how to cross barriers as well as he did, but we know we must try. Jesus' meeting with the woman is not just an example to us of reaching beyond cultural barriers; he also makes cross-cultural outreach a command for us to obey in his Great Commission (Matthew 28:18-20). He is not really the confusing Christ; he is the Christ on a mission to reach the world. Let's join him in his quest. Father, please give me a heart for people who are seeking for your life. Give me the wisdom to see the opportunities to touch these seekers that you have placed in my path. Let my love for the lost astonish others to your glory and to further the ministry of Jesus, in whose name I pray. Amen.